This recipe calls for a mustard crust similar to the classic lamb chops recipe served at Easter. Tangy and slightly sweet, this dish gains a lovely crust from roasting in the oven. Preheat oven to 425°F. 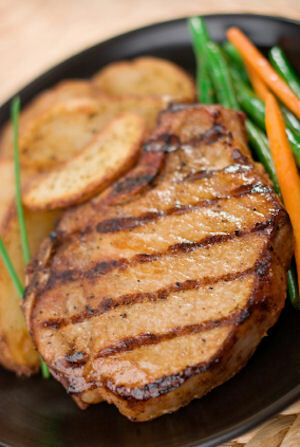 Season pork chops lightly with salt and pepper. Set aside. In a small bowl, combine mustard, sugar, mustard powder, rosemary, and garlic; mix well. Smear evenly over chops. Heat oil in a large, heavy cast-iron skillet over medium-high. Add prepared chops and brown on both sides, 4 to 5 minutes total. Transfer skillet to oven and cook 20 to 25 minutes, until no longer pink and cooked through. Serve warm. Amazing! My husband had 2 and now he has puppy belly. I can't wait to make this again. i made these last night and everyone loves them. Missed the garlic, but added mint leaves. Really amazing chops! Forget the oil. Simply coat the chops with the sauce and bake. Absolutely delicious! Making them again already. Fast easy family dinner that everyone enjoyed. I only had dried rosemary and that was fine. Will cook again. Followed the recipe verbatim, too many people, too few chops. Awesome! I will be making this again!! I didn't have rosemary, but it was still amazing! I also skipped the browning in the pan, instead, smothered with the sauce and increased cooking time in the oven! DELICIOUS! Really delicious. I did not worry about browning them in the pan first, put them straight in the oven with the sauce over and they browned and were wonderful. Made this today and loved it! Had to make my own dijon mustard. The pork chops were delicious! Showing 10 of 14 total reviews and comments. Average rating of 4.62 stars based on 13 reviews. Summary: This recipe calls for a mustard crust similar to the classic lamb chops recipe served at Easter. Tangy and slightly sweet, this dish gains a lovely crust from roasting in the oven. Crusty, nutty trout fillets with a buttery, citrusy pan sauce—tres increible! The family is going to love this cheesy, crusted trout recipe—use your fave cheddar crackers for a quick meal.